Yes, you can come to the AMC Esplanade Dine-In Theatre to just see a movie in a comfortable seat, but what sets this theater apart from other local AMC movie theaters is the ability to order restaurant-style food and drinks, including alcoholic beverages, and be served in the theater. AMC Esplanade is located in central Phoenix, at 24th Street and Camelback. Parking is validated at Guest Services for those who park the the Esplanade Parking garage. All seats may be reserved in advance. No need to arrive very early to stake out a seat if you reserve online. The AMC Esplanade theaters are small, so no seats are far from the large screen. Some Fork & Screen seats are close to the screen. Stadium-style seating means that your view will not be obstructed. AMC Esplanade can accommodate 3-D films. There's an extra charge. Cinema Suites are available only to those people age 21 and over. Fork & Screen movies are available to those 18 and over, or younger people accompanied by a parent. Seating in the Cinema Suites theatres are large, comfy recliners. 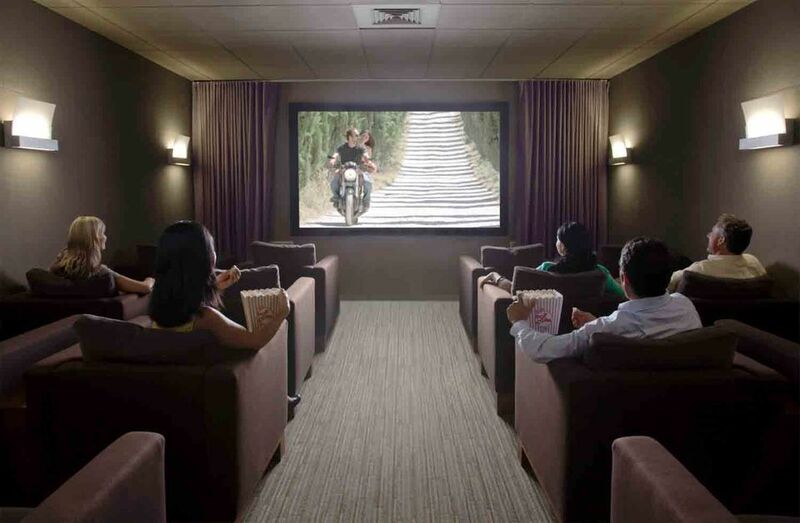 Three of us made plans to visit the AMC movies at Camelback Esplanade to watch a movie in the Dine-In movie Cinema Suites. As of this writing (March 2012) this is the only AMC movie theater in Arizona offering the food and cocktail service option with premium seating. There are two types of experiences at the theater. Fork & Screen theaters are for people age 18 and older, or younger patrons accompanied by an adult. In Cinema Suites theaters, no one under 21 years of age is permitted. Those age restrictions are in place for all movies at AMC Esplanade, no matter what the film rating. The online ticketing service is easy and the seating charts are accurate. I chose three seats that I guessed --there's no way to tell for sure -- were either level with the screen or slightly above, since I don't like to look up at a movie screen. Those tickets were $12 each, with a $1 convenience charge per ticket for a matinee. Total for three people, $39. There is a parking garage at the Esplanade, which is accessed off 24th Street just south of Camelback. Bring your parking ticket to the movie and they will validate it for you, up to four hours parking for free. The movie theater is directly above the parking garage, so just take the escalator up and you'll be at the theater. I retrieved our tickets from the kiosk (it's like an ATM) in the theater lobby. If you've read any of my previous reviews of dine-in movie theaters, you'll know that I like to have time before the movie to peruse the menu, order, and receive my food before the lights go out so I can (a) see my food, and (b) eat it, or at least some of it, before the movie starts so I am not distracted from watching the movie. Unfortunately, this wasn't to be at this theater. While we were told that we could enter the movie 30 minutes before showtime, that wasn't the case. They were cleaning the theater, presumably from a previous showing, and we were not allowed to find our seats until 20 minutes before showtime. Menus are at the seats, and by the time we got our drinks and gave the staffer our order, previews were already beginning. When the food arrived, it was already dark. The reclining seats of Cinema Suites are probably the most comfortable of any of the local dine-in movie theaters. There is no issue with leg room, and even when you are reclining, servers are able to walk in front of your seats. In front of each row is a wall. You can't see any of the people in front of you in the theater, since the seats are severely banked; you'll never have a problem here not seeing over someone in front of you! The wall however, seemed a bit high and I was bothered by the fact that when I reclined the top of the wall was just slightly at the bottom of the screen. Instructions are offered when you arrive. If you need service, there are buttons to push between the seats. It's a good thing, because twice during this movie I asked a server for something and, although they acknowledged, they never came back. Both times I hit the button for service to ask again and my request was then honored. I was aware, throughout the entire movie, of the light between the seats illuminating those buttons. I wish I could have turned it off. Having learned my lesson at other dine-in movies, I only order finger foods. I want to watch the movie, not deal with utensils and trying to find my mouth to deposit bites of food! There are plenty of choices on the menu here. I ordered the Classic Chicken Tenders ($11.99) and a soft drink ($4.50). Refills on the soft drinks are free. My spouse, who also opts for the finger food experience, ordered the Thai Tenders ($12.49). Our friend, having never before dined in a movie theater, ordered a soft drink ($4.50), Smoked Brisket Quesadilla ($9.99) and a Side Salad ($2.99), and subsequently complained about how difficult it was to eat salad in a dark movie theater. I told you so! The total food bill for lunch during the movie, including tax and tip, came to $60. The food was better than average movie theater fare, but was still pricey. Beware -- your server will try to up-sell your order by asking if you'd like certain things, but will not explain that those things attract an extra charge. For example, when our friend ordered the quesadilla, he was asked if he wanted the salad with it. Thinking it came with a side (our chicken tenders did) he said yes. It turned out that there was a charge for the salad. Not sure if something they offer comes with or costs extra? Don't be too shy to ask! Naturally, when I received the bill it was too dark to read it, and I wanted to keep watching the movie! I gave them my credit card and then waited for the movie to end before reviewing it and signing the slip. Bottom line, the movie and lunch for three of us was about $100. I'm not doing that very often! As I have said before, I like the premium movie theaters with spacious seating and especially the Cinema Suites option with reclining chairs in an intimate theater. Other theaters at the AMC Esplanade are Fork & Screen, with premium seating but not recliners, and more seats in the theater. You can order the same food there, and there may be children in those theaters. I like being able to choose my seats in advance with a seat mapper without standing on line at the theater. It is worth the price of the ticket for me. By the way, if you go to the movies here often, it might be worth it to join the AMC movie club, and then the $1 online convenience fee is waived. When I go to dine-in theaters, I prefer to order a sift drink or a glass of wine and maybe a snack or dessert to share. I can certainly recommend the dine-in movie experience at AMC Esplanade for a date night. My recommendation: go out to eat at a restaurant after the movie where you can relax and talk while you enjoy your food.